I regularly teach a Contemporary Issues in German-Speaking Regions course for intermediate to advanced learners. In this course, I want learners to become informed citizens and ultimately to learn to converse intelligently on topics of current interest in the German-speaking world. I hope to provide a format and an array of materials (linked at the bottom of the post) that any German instructor can use to teach a similar course. The format can also work with some minor adjustments or additions for Conversation and/or Composition courses — which I also do. 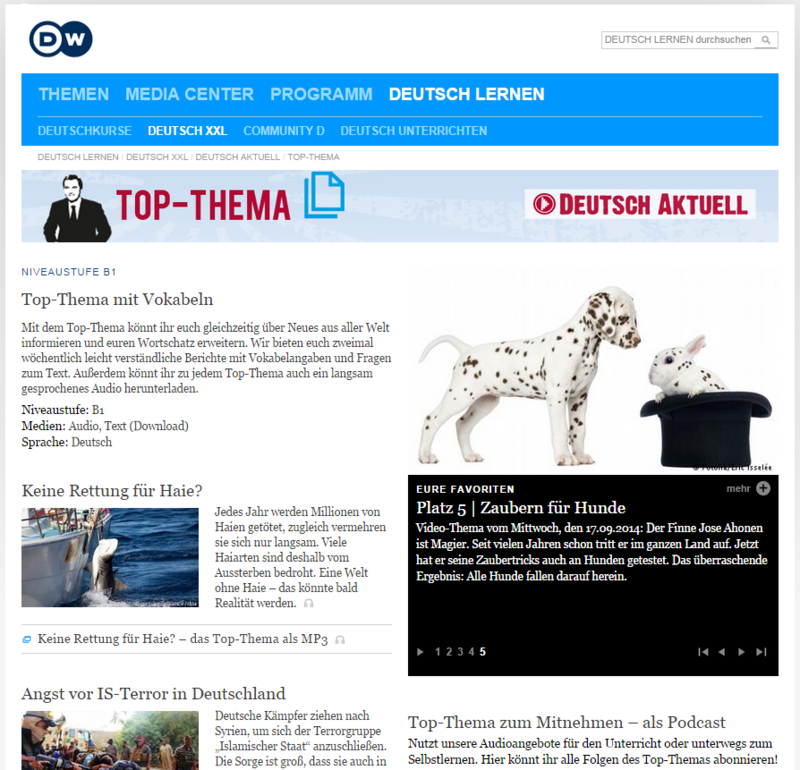 The core content for these courses comes from Deutsche Welle’s Top-Thema and Video-Thema. Why? The content is free (no need for expensive textbooks! ), it is current and ever-expanding, uses authentic language in both written and spoken form, and is managable in length, language use, and content for intermediate to advanced students. Moreover, the modules lend themselves to a range of extension activities for vocabulary building, linguistic analysis, grammar practice, and oral practice. I’m going to describe how I use these online materials. Then below I will link to all of the extension activities I have created. New Top-Thema modules are published each week on Tuesdays and Fridays. Each text is a simplified, 4- to 5-paragraph version of a longer article. A link to the original article is always provided at the bottom of the page. Each article is accompanied by a German-German vocabulary list (Glossar), five multiple choice comprehension questions (Fragen zum Text), one deeper content or exploratory question (Arbeitsauftrag), and an audio file of a native speaker reading the article in clearly enunciated German. According to Deutsche Welle, the articles are targeted for Level B1 learners. A new Video-Thema module appears every Wednesday. Each one includes a 2- to 5-minute video. A downlodable PDF (Aufgaben) offers a pre-listening/watching activity, a few comprehension activities, and one or two related language-use activities. A second downloadable PDF (Manuskript) contains the manuscript and German-German vocabulary list. According to Deutsche Welle, the materials are appropriate for learners at Level B2/C1. It is true that my students generally find Video-Thema material more difficult than Top-Thema material, even when working with the printed manuscript. For this reason, I tend to use Top-Thema more often. But I think it’s important for students to gain experience with both types of language consumption. While new material appears weekly, and certainly can be used as it is published, the older modules remain completely accessible. Several years worth are now available — Top-Thema back to 2007 and Video-Thema back to 2008 — so there are hundreds of themes to choose from. I personally choose not to take these in any particular order. Sometimes one theme naturally segues into another. I strive to find themes that will be interesting and relevant to my current students, that will increase their understanding of German-speaking culture, and that may tie into something currently happening in their own culture, community, or lives. I usually devote a week of class time to each module we work with. For Top-Thema assignments, students prepare by reading and listening to the article. I also ask them to practice reading aloud at home to prepare for reading aloud in class. And they answer the five Fragen zum Text. For the Video-Thema assignments, I ask students watch the video at home several times. They may and should consult the manuscript by the second or third viewing. They do the pre-watching and video comprehension activities in the Aufgaben-PDF. The materials provided by Deutsche Welle provide an excellent starting point for working with the theme and the language of the text or video. We start by reading the text aloud in class. All students have a copy of the text with them and I also project the text onto the screen at the front of the room. I randomly choose students to each read a paragraph of the text aloud. When the entire article has been read, I have the class chorally repeat words that seemed difficult to pronounce correctly while pointing them out on the screen. Then we move on to the Fragen zum Text. The answers are not always obvious. Sometimes there are only slight differences between choices. This causes students to think more deeply about the questions, answer choices, and content of the text. They must really understand what the questions are asking and what the answers imply. (Instructors should know — and I have just now discovered — that answer keys are available from both the Top-Thema and Video-Thema main pages!) The Arbeitsauftrag varies in difficulty. Sometimes students can jump right in and use the prompt to engage in discussion. Other times, students benefit from more practice with the article theme first. Welche Eindrücke hatten Sie beim Sehen? War es leicht zu verstehen? schwer? Wie oft haben Sie es durchgespielt? Haben Sie immer mehr verstanden? Es ist okay, wenn Sie nicht alles verstanden haben. Wir wollen das Wichtigste verstanden haben, aber man muss nicht jedes Wort verstehen. I ask how they answered the pre-viewing questions and whether their expectations were met after having viewed the video. Then we discuss each of the watching/listening comprehension exercises separately. Students relate what they chose for answers, we determine whether all agree or whether there is some disagreement. Then we play the video through and I have students raise their hands when they think an answer to a question in the activity is being given. If necessary, I stop the video and replay the relevant section while referencing the question that the clip answers. We follow this procedure or something similar for each separate viewing comprehension activity. If necessary, I bring up the manuscript on the front screen and we analyze the language more closely to determine what is being expressed in the video. Students then work in pairs or groups on the remaining video questions, which often delve into issues of language usage. This opens opportunities to talk about structures or vocabulary. I find that the Arbeitsauftrag that follows sometimes seems like too much of a leap from the comprehension exercises. Students are not always linguistically equipped to discuss the theme in any detail. This is where some extension activities can help bolster learners’ language skills and give them the needed preparation for moving to freer expression on the topic. The activities described above encompass the exercises provided by Deutsche Welle. But the materials offer many more opportunities for language and thematic exploration. I want to promote deeper comprehension, promote oral practice, prepare students to not only understand but to actively use new vocabulary in language production. I want them to analyze and understand how what is said is being said and why it is said that way. In short, I want students to engage in activities that get them thinking, speaking, practicing, and hopefully, within a week’s time, able to converse and even write intelligently on the chosen theme. Here are the Deutsche Welle modules I have further didacticized. I also have materials for the following modules, but just haven’t had a chance to get them organized and uploaded yet. If you are interested in having my materials for any of these, send me an e-mail ([email protected]) and I will forward you what I have. The Deutsche Welle materials provide the springboard for the language work we do in class. But in case you were wondering, these are not the only course assignments and activities. Students also do weekly journal writing, write three or four formal essays, and give two oral reports. They complete grammar assignments tailored to their individual needs. In addition, they are required to maintain a weekly vocabulary notebook. More on these things later! WHAT IS THE MINIMAL AMOUNT OF TOP THEMA AND VIDEO THEMA MATERIALS SUFFICIENT , ESPECIALLY FOR PREPARATION FOR B2 EXAM? It is difficult to assess. The various Top Thema and Video Thema modules expose learners to various aspects of language, but because they do not constitute and instructional program, any arbitrary mix of them doesn’t necessarily cover all of the things you might need to know for B2 exam preparation. For that I would recommend a course or book that is specificially tailored to exam preparation.